Best to nip the political career of Rep. Neal Collins in the bud. 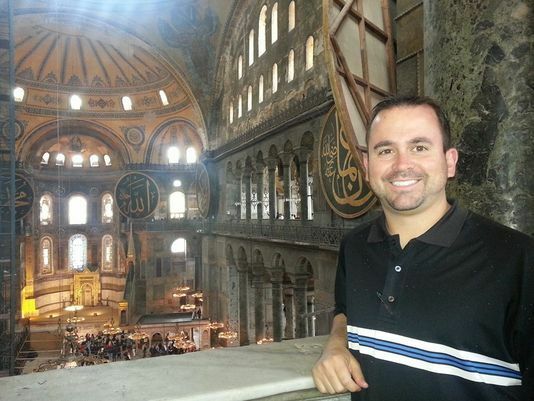 State Rep. Neal Collins inside a former church, mosque, now a museum during his 2015 trip to Turkey. More than a dozen South Carolina legislators have taken trips to Turkey in the past 10 years that were paid for by groups associated with an exiled Muslim cleric who was accused of being behind a failed coup attempt in Turkey last summer, according to an analysis of legislative disclosure forms by The Center for Public Integrity. Among those legislators are two from the Upstate. Rep. Neal Collins, R-Easley, made a trip to the country in 2015, and longtime Sen. Mike Fair, R-Greenville, who lost his re-election bid in the primary last year, took a trip in 2011. They were among more than 150 state lawmakers who took trips to Turkey paid for by groups inspired by Fethullah Gulen, who teaches a brand of Islam that seeks to fit the religion's traditional teachings to a modern world.